If you're looking fo a hunting/utility knife then the Pendleton is ideal for you. This knife is designed by Lloyd Pendleton to be an affordable and practical hunting knife. With a Krupp 4116 stainless steel blade and polypropylene handle this knife has good edge holding properties, is easy to re-sharpen and is as tough as nails. 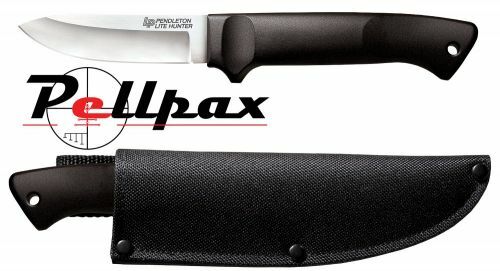 With a blade length of 3" this knife can be taken anywhere since it's compact. Weighing only 2.7oz this knife delivers a lot of power in a small package. The polypropylene handle is 4" long allowing it to sit comfortably into virtually any hand. The curved shape give both comfort and control to any user of this blade. When behind this blade you feel completely in control and can cut, slice or gut anything with high precision. To top this blade off you will get a Codura Sheath to protect the blade, yourself and others when the blade is not in use.